FUNCHEM® Alcohol-Based Hand Rub complies with World Health Organization (WHO) recommended Formulation I with 80% v/v Ethanol while Formulation II with Isopropyl Alcohol 75% v/v as active. Both formualtion contains Glycerol as skin emolient and fortified with small amount of Hydrogen Peroxide in its efficacy. Ensure that hands must be kept clean to prevent the spread of infection, makes for Better Hospital Hand Hygiene. Available in convenient 500ml bottle On-Counter pack incorporates with pump head dispenser to prevent contamination of the nozzle-end and mini pocket size of 50ml and 100ml handy pack complete with flip cap opening and spray head on request for easy dispensary. 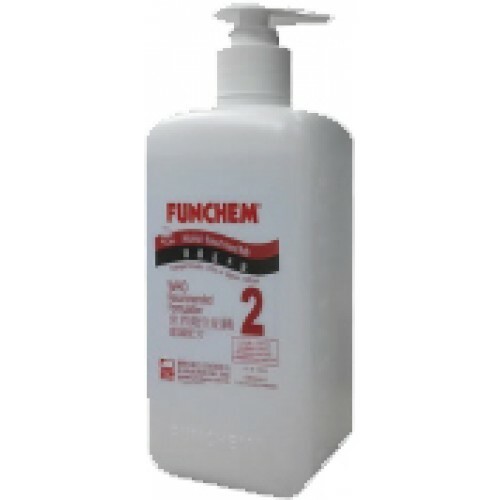 FUNCHEM® Alcohol-Based Hand Rub is an alternative to standard hand-washing, less time consuming and at least as efficient. Shelf life has 24 months from manufacturing date.